In a recent post entitled Refresh and Restart I introduced the idea of religion as having four aims, considered on the analogy of computer software applications. 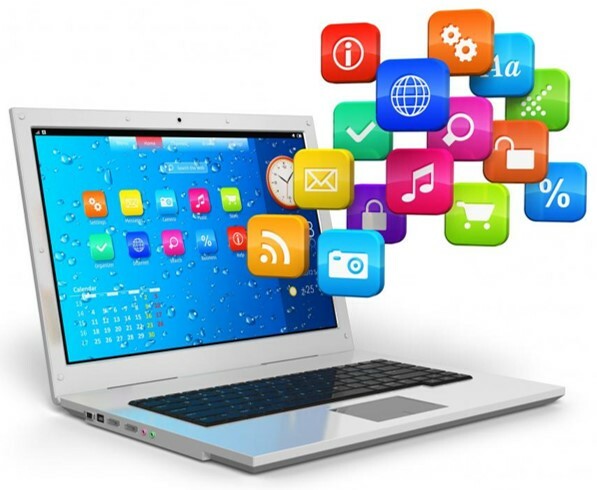 While every program needs to be compatible with the computer’s deeper operating system, it will also have a specific design objective in what it does – organize data, calculate numbers, generate text, create graphics, edit videos, play games, and so forth. You won’t get a spreadsheet to trim and splice segments of video; it wasn’t designed for that. Similarly, a given religion (take your pick) needs to be compatible with and supported by the operating system of human spiritual intelligence. This is the thread of our quadratic intelligence that intuits the deeper ground and higher wholeness of existence, as well as our communion with all things. When religion loses this thread – by that peculiar combination of ignórance, conviction, and dogmatism so common today – it ceases to be true in the sense of expressing and speaking to our spiritual quest for oneness. Assuming fidelity to this deeper register of spirituality, a religion can also be evaluated according to how effectively it accomplishes one or more of four aims. Even though a given religion will carry all four, certain historical, social, and psychological conditions will focus its preference on one more than the others. The danger is that these others will be pushed out of the frame altogether by a growing obsession with this one, now absolute truth. This is a second way that religion ceases to be true: when it makes one way (or aim) the only way of salvation. 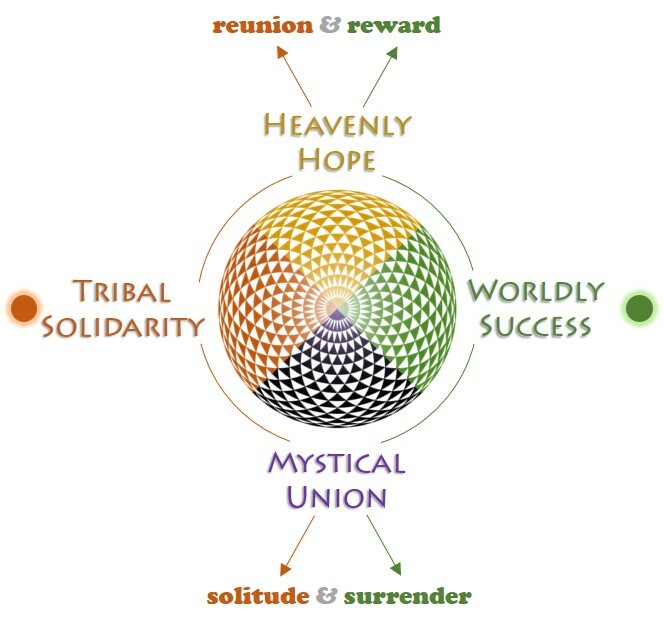 The diagram above illustrates the four aims of religion arranged as a mandala or sacred design. I also want to make a case for arranging them just as I have, as a polarity of opposites on a horizontal and vertical axis. This particular arrangement shifts our contemplation from a mere two-dimensional pattern to the mandala of four aims as also a matrix of meaning. The four aims, I am suggesting, are basic to our construction of meaning in the way they orient our quest into four major fields (or zones) of human concern. Because humans depend on social bonding not only to survive infancy but to ‘be somebody’ and live a meaningful life, the social concerns of belonging, intimacy, trust, and group loyalty continue to figure prominently throughout our lifespan. There’s a reason that solitary confinement is one of our severest punishments. As the personality individuates a unique identity (ego), the process of differentiation must be counterbalanced by affiliation in order to keep us properly connected to our tribe. Person, personal, and personality are all forms of the basic idea of persona, referring to the ‘masks’ we put on (or roles we play) in our interactions with others. The arc of a human career – through the changing roles of family, work, and service to our community – is profoundly affected by the nature and quality of relationships that sustain us in tribal solidarity. Still, the prosperity of every society depends on more than strong bonds among its members. Our young must not only be loved, supported, and encouraged in their development as individuals, but they also require the necessary education, training, resources, and opportunities to take their place in our shared economy. As parents, we work and hope that our children will themselves grow up to work and hope the same for their children. No parent has ever dreamed of having bums and freeloaders as descendants. Instead, we want them to do their best, to accomplish the goals set before them, to one day be successful and responsible adults. Across the cultures worldly success has been measured in terms of material prosperity, a healthy family, good reputation, and a long life. While not all religions hold the same view of what happens or where we go when we die, they all articulate visions of life that expand the frame beyond our fourscore-and-ten (if we’re lucky on that metric of worldly success). Even if we’re not believers, most of us have at least contemplated our short measure of life against a backdrop of the generations and even cosmic time. Regardless of whether we ascribe to a doctrine of personal immortality, we all hold the hope that our lives matter, that good behavior counts for something, and that not everything about us will simply rot away to nothing after we die. ‘Heavenly’, then, implies the larger context and longer view of our life which serves to amplify (rather than extinguish) the precious value of each moment, up to and including the very last one. Even if many religions don’t promote it as a bona fide orientation or aim, they all – that is, the ones that are true in the two senses mentioned earlier – acknowledge a fundamental distinction between our beliefs about god and our experience of God. The case change is meant to reflect this difference, between a present mystery (‘G’) and the names, concepts, attributes, and personality we may attach to it in our mind (‘g’). When a religion’s concept of god gets authorized and fixed in place as orthodoxy, the availability of that mystery to our present experience is closed off – or veiled – by the meaning draped over it. That drape or veil creates the illusion of God as an object (god), separate from us as a being among beings rather than the Being of beings – that is to say, as the ground of being-itself. The aim of mystical union is to lift away the veil of separation for a present experience of the mystery. With the four aims now in view and more fully defined, we can briefly take note of some creative tensions among them – and of the entire mandala as a matrix of meaning. The horizontal axis sets tribal solidarity and worldly success in opposition, insofar as the process of ego formation and ‘making a name for ourselves’ involves separating from those primary bonds where our sense of security first took root. For its part, the tribe can pull back on this process too hard with its expectations of obedience and conformity, traditionally presided over by the patron deities of theism. From the other side, an unrestrained egoism will brashly disregard tribal values for the sake of individual gain and glory, as is widespread today especially in the North Atlantic societies of the modern West. The vertical axis between the aims of heavenly hope and mystical union carries a tension of positive and negative attitudes, respectively, as they relate to the conventional arrangement of those horizontal concerns. On the positive side, heavenly hope anticipates a final reunion (accent on community) with those heroes, saints, and loved ones who departed before us. It also holds the promised reward for our faith, virtue, and sacrifice in this life. With our ‘treasure in heaven’, we can more easily share our time and possessions with others who need them, as well as find strength to endure hardship and loss. Negatively, the path to mystical union is universally depicted as necessitating a retreat into solitude (apart from community) where we surrender our attachments, ambitions, and finally our personal identity (i.e., our worldly success) to the essential mystery of oneness. It’s important to understand that ‘heavenly destiny’ and ‘ground of being’ are both operating in the matrix of meaning as metaphors which serve to open awareness beyond the limits of tribal affections (us and ours) and egoic entanglement (me and mine). A literal reading of these metaphors turns them into distant and esoteric locations, stripping them of their power to facilitate the breakthrough of consciousness that true religion makes possible.